This is a review of the Longevity TIGWeld 200SX and why I choose it over the Miller Deversion 180 and the Lincoln SquareWave TIG 175 TIG Welder. These criteria are what I need and I am sure most other welders have the same concerns. How well the welder welds is obviously the big question but if all of the machines can do the same job then I am interested in the other features that I want. Here are the facts about these three machines side by side directly from the manufactures. The TIG torch, cables, foot pedal and all of the accessories feel solid and of the same quality you get from Miller or Lincoln’s competing models. Longevities TIG torch is a WeldCraft and they are the standard brand that most people use. TIG torches do not get better then WeldCraft’s quality. The only thing different I used from what comes with the machine was a gas lens to weld with. These are common when welding stainless steel pipe and working with air cooled torches. The weights of these machines vary with the Lincoln being 144 pounds more. That is a obvious sign that Lincoln is simply putting old technology into what the call a “New Machine”. The rest of the equipment is all pretty much the same. How Good Does The Longevity TIGWeld 200SX Actually Weld? To start the TIGWeld 200SX Review, Longevity kicks both of the others welders buts in maximum power out put and duty cycle. The duty cycle and output amperage of the Longevity TIGWeld 200SX is in the class of the Miller Dynasty 200 which costs $3,856.00. The only thing that separates the Longevity model from the Miller Dynasty is the pulse arc features. One of the main features that I like about both the Miller and Longevity is the ability to plug into a 110 volt outlet and be able to weld. This single feature is a dead give away that Lincoln is still using old technology. Being able to run on 110 volts is nice when you need to do a small repair or you are welding light gauge metals. I would like to mention that all of these welders say they cannot weld heavy plate and I will tell you they are All Wrong! If you ever work in a shipyard or pressure vessel shop then you know you rarely need more then 150 amps to weld heavy plate and pipe over 1″ thick. Heavy plate and pipe welding is done in multiple passes. This is a trick all of the manufactures use to scare people into buying a bigger welder. The testing I did on this machine was done building a Aluminum trailer for a boat i just bought. Just like the MIGWeld 140 review I did. I ran this machine hard and on 110 volts. The only issue I had was the TIG torch got too hot to hold and the machine never tripped the overheat protection. Below are the pictures of the welds I did. I do want to stress that it has been years since I welded aluminum and I have less than 2 hours of welding logged in over the last 18 months. So I am a bit out of touch. In the first picture on the left I did those welds vertical up before I flipped the frame. As you can see once the aluminum heats up the welds gets smoother. The welder has no problem welding this 1/8 inch thick square tubing. The tubing size is 2X4 inch Aluminum grade 6061. The second picture is a done in the horizontal position using the same heat setting. The amperage is set at about 170 amps for this thickness of aluminum. You do need to wait for the aluminum to preheat before welding. Finally the third picture is a weld done in the flat position. All of the welds have excellent penetration and the machine had no problems besides the TIG torch over heating from the amperage needed to weld aluminum. This overheating issue is a simple fact of welding with air cooled TIG torches and it would not matter what machine you used because all of them have the same problems. If you need to weld this hot all of the time then you need a water cooled TIG torch. The Longevity products that I have tested so far are just as good as the big brands like Lincoln and Miller. The main difference is the price! Quality is about the same and the big issue that most people are concerned with is that many new welders are made in China. That used to be a issue but these days most welding machines have a computer inside and guess what? Chances are these computers are made by the same companies. It does not matter what brand you buy or where it was assembles. The odds are there are Chinese made parts in all of these machines. For my money I rather save over half the price on a product that has a better warranty and has the features I need and want. Overall Longevity welders are Great machines and you just can’t beat the prices. 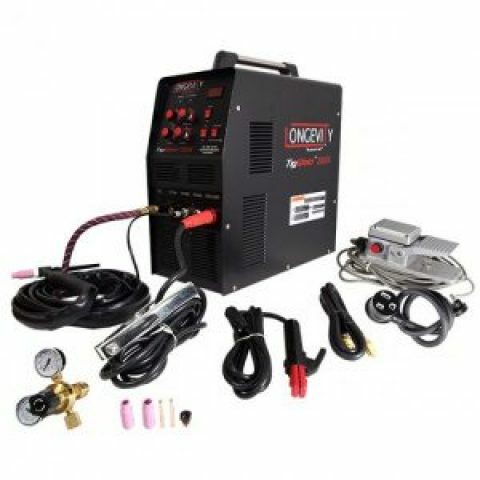 If you are going to buy a new TIG welder then you need to look at the Longevity TIGWeld 200SX. Finally, below are more pictures of this project. The welder did a good job and as you can see I can’t complain about anything! I built a aluminum trailer for my new boat and this has saved me a lot of money. The boat is a Carolina Skiff that I can now tow with my car to fish the Florida Everglades, Lake Okeechobee and I can even hit the intra coastal and beaches near by or even the Florida Keys for some diving. A TIG welder can do so many things to save you money and my next project will be building a Tee Top for the boat.